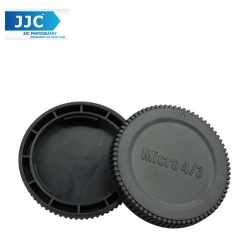 JJC L-R7 Objektivrückdeckel is design for all Micro Four Thirds lens. The JJC L-R7 housing cover is fully compatible with the Olympus E-P1 and Panasonic GF1 and other Micro Four Thirds digital cameras. When storing the camera without a lens, protects the body cap from the image sensor and camera's internal components from dust, moisture and other elements. JJC L-R7 replaced OLYMPUS LR-2 Rear Lens Cap. JJC L-R7 replaced OLYMPUS BC-2 cover. JJC L-R7 housing cover with the Olympus E-P1 and Panasonic GF1 and other Micro Four Thirds digital cameras compatible. L-R7 Objektivrückdeckel is design for all Micro Four Thirds lens.